The Mission in Motion trailer will be at Annual Conference. You can bring your items on Tuesday evening after dinner from 8 p.m. until 9 p.m.
Next Friday, May 24, is the deadline for meal reservations. Please either register online or get the check in the mail. We will be doing our own Pictorial Directory for those serving churches. When you pick up your Worship Booklet at registration, you will find the place and times in the agenda. The Mission in Motion trailer will be at Annual Conference. You can bring your items on Tuesday evening after dinner from 8 p.m. until 9 p.m. UMCOR is in need of Relief Kits but you can bring whatever you have. Kens sentiment was echoed by many as the tales from those in the storm’s path yesterday, and the images of the storm and the devastation poured across the internet and airwaves on Thursday. (While there are several good synopsis out there, The Dallas Morning News has an excellent running update complete with regularly updated video and other stories related to the storms. One thing that the news outlets are reporting the Rev. 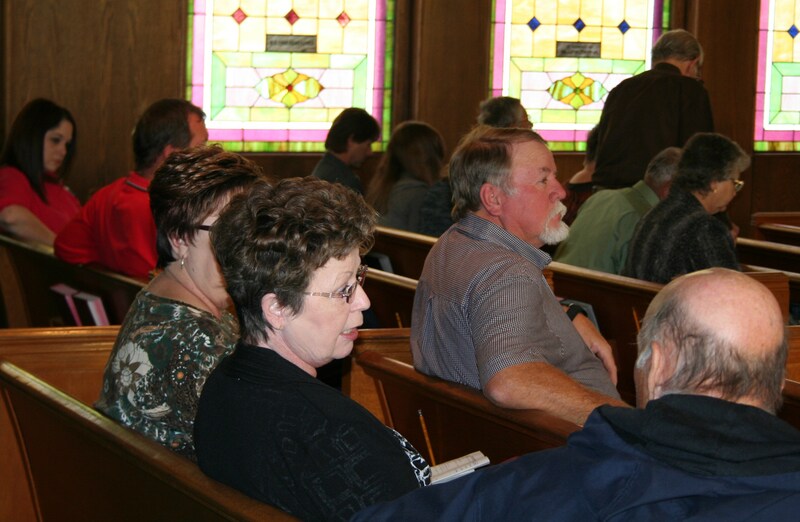 Laraine Waughtal wanted to be sure to clear up is that while First UMC Granbury is serving as a place for folks to go and register with CERT for volunteers, this is just a registration site. No volunteers are needed on the ground at this time and officials are still asking for folks to stay out of the area. Laraine will register the Central Texas Conference as a whole with CERT and then coordinate our efforts, so there is no need for individuals to drive to Granbury and potentially be turned away. 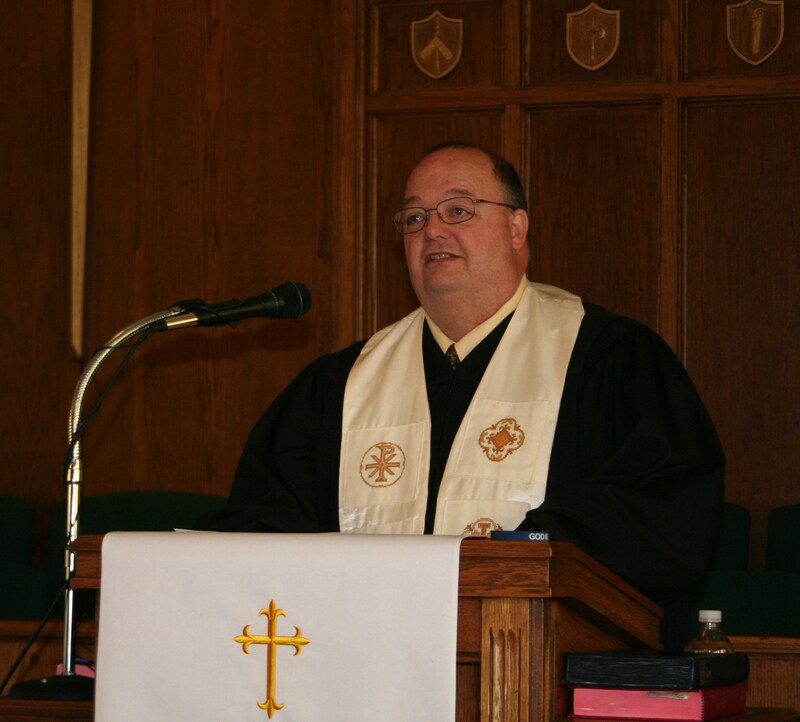 The CTCSC also received the following from Patrick Turkett of Ovilla UMC yesterday. “Ovilla United Methodist Church has had a team of 15 working in Baldwin, LA all week at the Sager-Brown UMCOR Distribution Depot. We just received word from them that the distribution center and our Missions team have loaded up an UMCOR truck full of cleaning buckets and health kits from distribution and are now driving it from Baldwin, LA to Granbury.” Those supplies should be on site and ready to help today. Thank you so much for the prayers, calls, e-mails and texts. The North District has been hit pretty hard by the tornados of last evening. I have spoken with the pastor of First UMC Cleburne this morning who reported that the roof of the parsonage is gone, and many homes around it are completely demolished. There is significant damage in and around Cleburne. So far the word from Waples and Granbury proper is that there is damage, but not severe. However, the Acton / Rancho Brazos area was hit very hard. As of about 10 this morning, the search and rescue teams are still in the area accounting for persons. No one is being allowed in the area. Acton UMC’s community center at Rancho Brazos has sustained damage – some of the roof and gables are missing down to the rafters. Those who live in this area were some of the least likely to be insured or have a means of recovery. Please keep them in your prayers as well as the families of those who have lost their lives. We will keep you posted through the CTC website and the North District Facebook page as updates occur. There still isn’t much new to report regarding any specific support needs for those affected by last night’s storms, but we have heard from several folks wanting to know how to donate money to the relief efforts. As in the West Relief efforts, folks are encouraged to donate through their local church and noting “CTC Spring Storm Relief” in the memo line. You may also pay via PayPal (click the Spring Storm Relief Fund graphic to the right) and you may also send checks directly to the Central Texas Conference Service Center, Attn: CTC Disaster Relief, 464 Bailey Ave., Fort Worth, Texas, 76107. 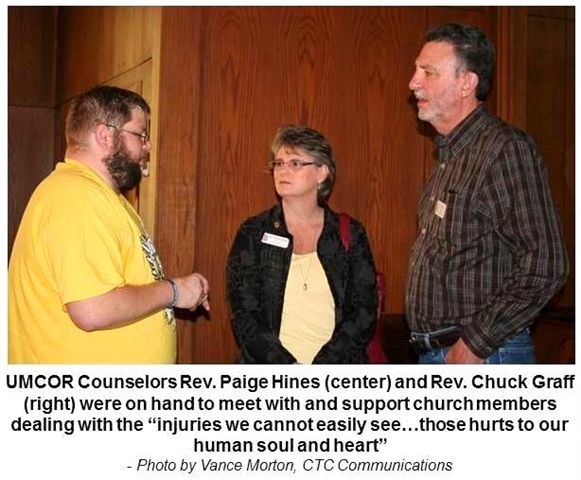 Please make those checks payable to CTC Disaster Relief and put Spring Storm Relief in the memo line if you wish to donate directly to those relief efforts. At this time there is still no call for any specific supplies or donations – though gift cards to building supply outlets or grocery/clothing stores are always welcome in these situations. 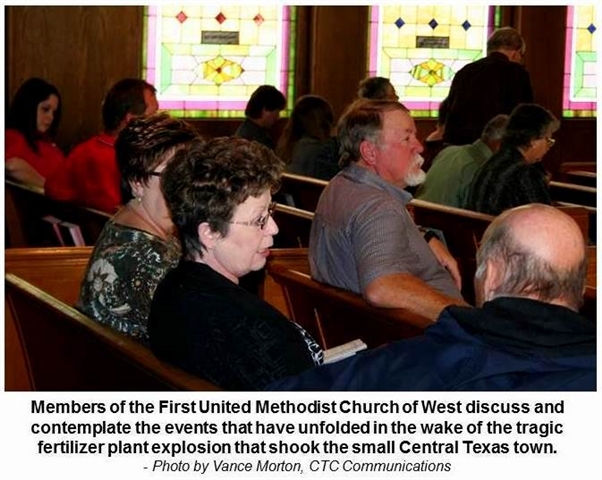 The United Methodist Committee on Relief (UMCOR) is in regular contact with the Central Texas Annual Conference Disaster Response Coordinator Rev. Laraine Waughtal and both UMCOR and Laraine have reported in the last few minutes that volunteers are still not yet needed as emergency services and first responders still have much to do to complete their work before damage assessments can begin. Please check back soon for an updates as they are avaialble. 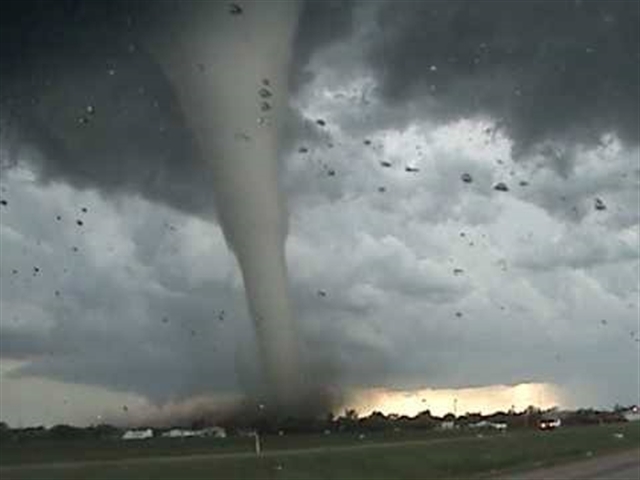 Severe weather swept through the North Texas Wednesday evening. 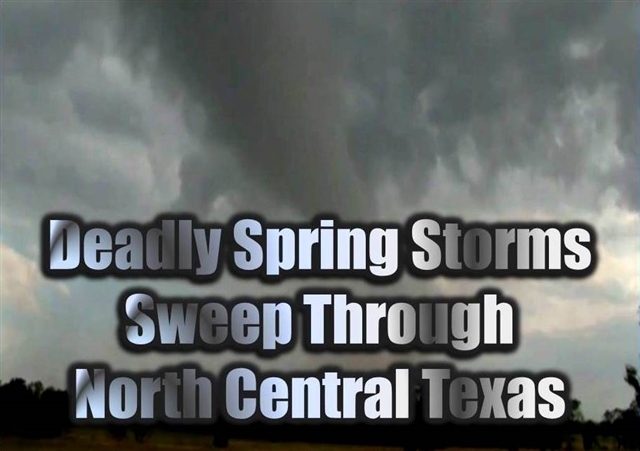 While there are reports of damage across many of the counties in the area, at the time of this posting, it appears that Hood County suffered the most severe damage as a tornado slammed into the area injuring dozens and causing widespread damage. CBS11 News is reporting that several area churches, including Granbury First UMC, are opening their doors as emergency shelters for area residents. Kathy Jividen, a spokeswoman for the Hood County, Texas, sheriff’s office said there were “multiple fatalities” in the wake of the storm. Authorities in Granbury reported the hardest hit area was the Rancho Brazos subdivision (southwest of Granbury) and adjoining areas along Lake Granbury, according to NBC5 in Dallas Fort Worth. Several news outlets are reporting severe damage in Hood County, that emergency responders are preparing for possible casualties in the area and that officials were sending school buses and helicopters to affected neighborhoods in and around Granbury to help with evacuations. Of course, at this posting, details are still sparse and most are unconfirmed. Hood County is not the only area in the Central Texas Conference that has been affected; reports of flooding and damage in Cleburne and much of Johnston County are also being reported. At this time, six casualties have been confirmed and that number could climb because as many as 14 people are unaccounted for. At this point, reports of damage are still preliminary and sketchy – and most likely will be until the storms pass and daylight allows officials the opportunity to better survey of the area. Rev. 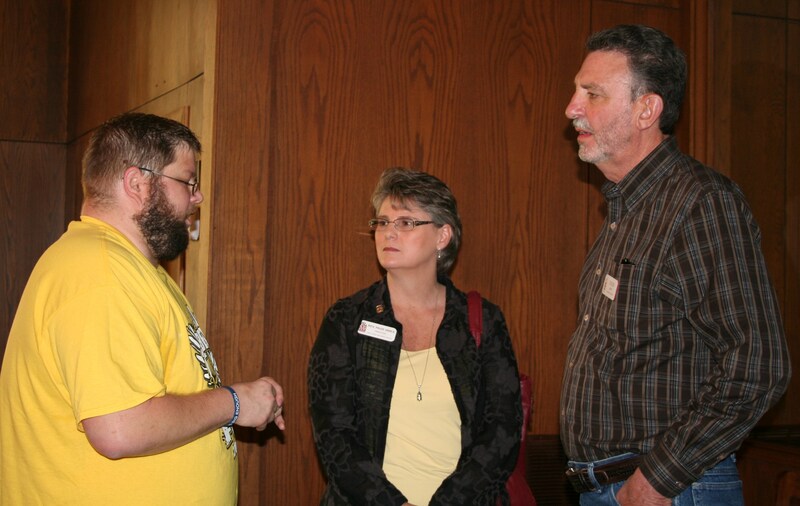 Kyland Dobbins, CTC Mission Experience Coordinator, echoed the call to remain patient and vigilant. “In disasters of any kind, we must wait for the professional emergency responders to contain the situation by securing the residents and other people in the affected area,” Rev. Dobbins said. The Central Texas Conference Service Center will monitor the situation and learn the extent of the damages via media outlets and other disaster response contacts in the affected area. Once the first responders have completed their work, then assessments will be done (just like we saw in the wake of the explosion tragedy in West, Texas). Once those assessments are completed we will then learn when other volunteers will be allowed in the affected areas to begin our response to this natural disaster. Please join us in praying for everyone affected by tonight’s storms. We will keep you updated as quickly as possible on any damage to our Central Texas Conference families, churches and communities as well as when you can help and how. The words of the Horatio G. Spaffords great hymn “It Is Well with My Soul” (No.377 in your United Methodist Hymnal if you’re playing along at home) have been sung countless times by countless worshipers in countless churches over the years. 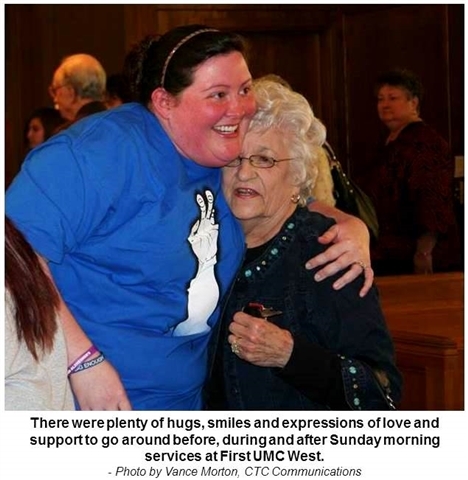 There is little doubt, however, that the words have ever held more meaning to those doing the singing at First United Methodist Church of West Sunday morning. The mood of those filling the pews of the nearly 120-year-old church would best be described as that of a people still in shock or mourning – at least that would be the perspective of someone visiting for the first time. Such a perspective, while understandable and probably even accurate on some levels, was quickly proven to be mistaken. 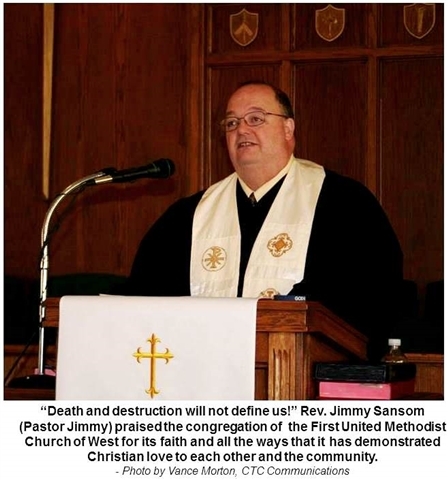 During the course of the morning service and in conversations following, West FUMC proved to be a congregation dealing with the tragedy that has befallen its community with a peace and strength that comes from an unshakeable faith in the goodness and mercy of God. Whether brought forth in the opening statements and sermons, prayer requests, songs or during a special time of sharing, the message of the day was consistent and clear – there is nothing to fear for God has been, is now and forever will be with us. Following Rev. Scott, it was time for the joys and concerns of the congregation to be brought forth and this is the moment that it became evident to all that this collection of Christian believers was bruised not broken. Instead of the expected prayers of concern for what had been lost, the first prayer was a prayer of joy for all the ways that God has revealed Himself since the explosion. This was followed by prayer of thanksgiving that it happened when it happened because the human losses could have been so much worse during almost any other time. The next comment was a reminder for all to find time amidst all the chaos to travel a few quick moments in any direction from town to witness the springtime glory that is the Texas Wildflower season. 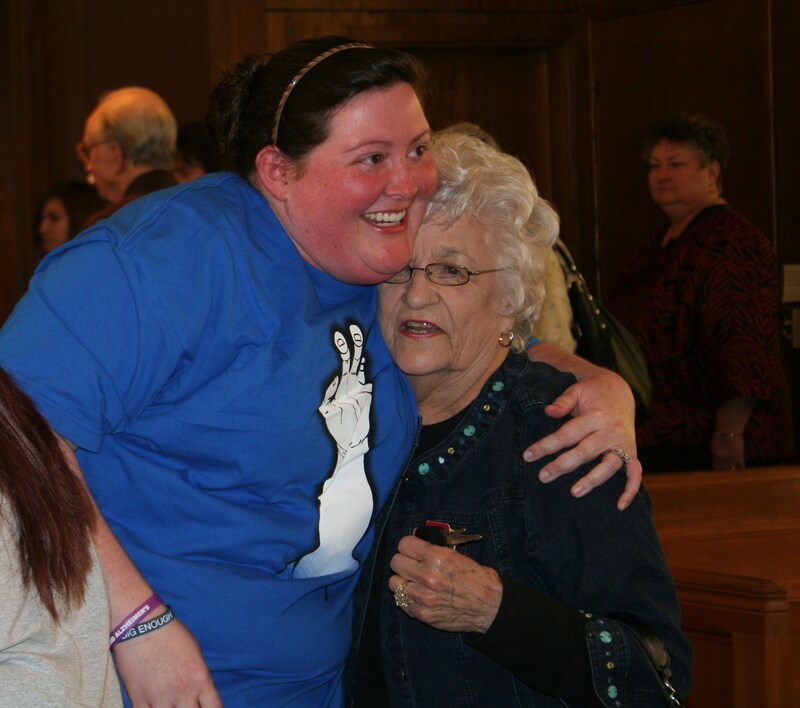 It is indeed well with the souls of West FUMC. Please look for a video tomorrow featuring highlights of the comments made during the service.